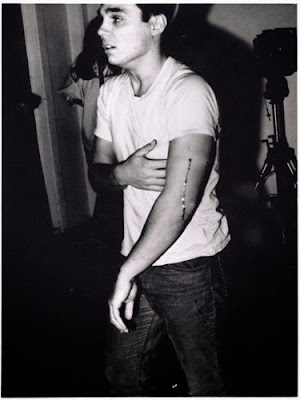 Chris Burden died yesterday at the age of 69 and most times when an artist dies that I like/has influenced me, I feel something but usually not enough to write about it. But this morning when I woke up I was still thinking about him. It was the same sort of feeling when Mike Kelley died. Kelley killed himself though, Burden died of malignant melanoma. That doesn’t change things that much but for Kelley it was a choice and for Burden it is the fate of things and that makes it seem somehow sadder but also bigger and uncontrollable. The first time I learned of Burden’s work was when I was an undergrad in art school. I was from the suburbs of New Jersey and going to a conceptually focused program was a jolt to my brain. A good jolt. I learned about Burden’s infamous works. The one where he had someone shoot him in the arm, the one where he crucified himself to a VW bug, the one where he bare chested crawled on pieces of glass, the one where he stood for hours on end on a stool, the one where fire was involved. It was a brain melt for a seventeen year old who didn’t even know what contemporary art was let alone performance art. It was cool, it was punk, it was ‘art’ to me right away. I didn’t need any convincing. I was sold, I knew that this was weird, good and honest. Burden has this bizarre quality to his work. It is off, it is nervy and makes you nervous. There is this commitment, this total belief and follow through. It is spectacle but without the irony, without the motivations. It is a test of something. They are one-liners, they are male, they are slightly dumb in some ways but there is something so bare and knuckle white about them that make them compelling. The early performances are like car wrecks; you just have to look even if they make you queasy. This vibe is also in his video works. I saw them online a few years later but then saw them in their entirety at a PS1 show. This is when he bought slots of commercial time on prime time TV in the late 70s and made inserted advertisements. They were bizarre. They are only a few seconds. They were like splashes of cold water, slaps in the face, a dark comedy bit. They were of him claiming himself to be an artist in the likes of Leonardo da Vinci. Or of his performances like the one with him slithering on broken glass. They were adbusters before there was such a thing. They were funny, wry, dark and I can’t imagine how it might have felt to see them as they were purposed for. Was there someone in the middle of somewhere who saw this and thought ‘Who is this Chris Burden?’ I hope so. These defining early works were not it though. Burden has had this rare arc of an artists’ life and actualization where he didn’t re-invent himself but just evolved and people followed him and supported him along that path. He was a sculptor most essentially. The body was the medium in the early works but then this branched to more rational and placeable objects. He loved models, trains, mini metropolises, topographies of humanity. It was like he was a kid perpetually tinkering and imagining and although, for me, they feel over-thought at times, they were obviously things of passion. The most recent show of his works that I saw was at the New Museum in 2013. It was as good as you could get in that crap building. In the show there was this video in which steel beams were dropped from a large crane into mud. They plopped and plopped and it was amusingly playful in its violence. It was the Burden I feel for in college. It was a perfect note of a piece. The work that sticks into my mind the most though is something that I may have made up but am pretty sure is attributable to him. I’m just going to go with it and keep it allotted to him in my memory zone. It may not be a piece, per se, but it is a reflection Burden’s character. There was a group of collectors, or maybe they were trustees for a museum in LA, anyways, they were told that they were going to meet the artist in one of those glad handing fundraising events everyone has to endure. The guide was instructed to bring them to a cliff near the Pacific Ocean. The group walked and walked and walked. Finally they get to a lookout point. The guide gives them binoculars. Then there is Burden. In a one man canoe (kayak) in the middle of the Ocean. There he is. You saw him.